Electrical work around the home can seem a bit complicated and intimidating upon first glance. Once you get the hang of it, though, you’ll notice it’s not as hard as you may have first thought. A multimeter is an essential tool for any home electrician, which is why we’ve compiled a list of the best multimeter options for all of your needs. Take a look at the products we’ve included and see if you can find one with the features you’re looking for. Before jumping into our list of the best multimeter options, it helps to understand how to use a multimeter and the different parts of a basic multimeter. 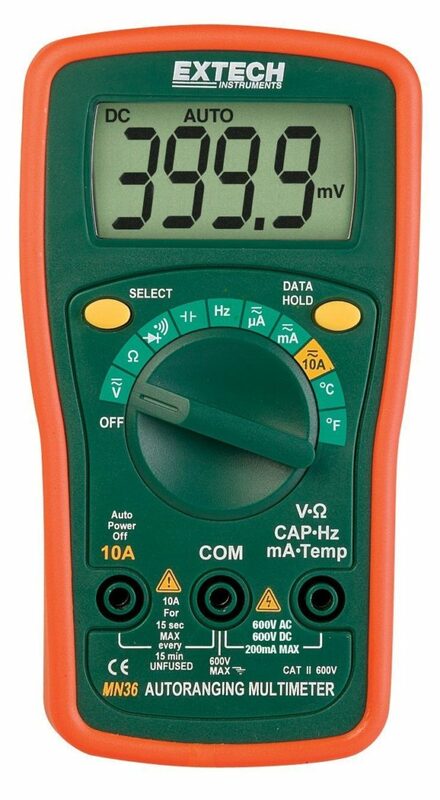 A multimeter is an electronic testing tool that allows you to measure volts, resistance, current, and more – depending on the level of multimeter you purchase. The more expensive the model, the more features and readings you will get out of it (more on this ahead). The screen of the multimeter, or the display, will give you the numerical measurement for your test. Almost all of the multimeters you see will have a digital display, which is much easier than the analog display some of the older models have. Below the display will be some numbers or a knob – depending on what kind of multimeter you select. These inputs are options for voltage, current, continuity, resistance and other specifications you multimeter may read. On the bottom of the device, you have your input jacks. The simpler models have three, although some of the more expensive multimeters may have additional ports. The COM port will receive the negative node in the electrical component you’re testing. To the right is usually a port that allows you to test voltage, resistance, and other elements. On the far left will be a port that measures current. It will be labeled in maximum AMPs, so you know how high you can go with a particular multimeter. There is a wide range of multimeter options to choose from, and the price range for them might have you scratching your head. You can find inexpensive models at your local convenience store, and more expensive models through several outlets. So, what’s the difference between an expensive multimeter and an inexpensive one? Will the best multimeter on the market break the bank? The answer depends on what you intend to use your multimeter for. Those who want a multimeter for home use can often choose one of the cheaper models without a problem. These cheap multimeters give you everything you need for routine testing, so there’s no need to spend too much on features you won’t use. If you pride yourself on your DIY electrical work, though, you might want to spend a bit more for a multimeter with added features. Everything depends on your experience level and what you’re looking for in a product. It can be nice to have a few extra features in your multimeter – even if you’re not sure you’ll use them. When the price is similar, it’s often worth going for the added features in case you need them down the line. This isn’t always a good idea, however. Some multimeters overload you with electrical readings and clutter the small display of the multimeter. These products can be a bit confusing for beginners or novice electricians. It’s important to strike a balance between features and simplicity when you’re shopping for a multimeter. Consider your experience level and needs when you’re looking for the best multimeter for you. The multimeter you choose to purchase will depend on your experience level and measuring needs, as we’ve detailed above. As a general buying tip, however, you should always be looking for the most accurate multimeter in the general category. A lot of multimeters look very similar to one another. More often than not, the difference between the two products is the level of accuracy with which it measures. The easiest way to tell the accuracy of a multimeter is by looking at the specifications. Manufacturers will list the accuracy percentage on their products. When they don’t make this information easy to find, it’s an indication that this probably isn’t the multimeter you want to buy. The smaller the accuracy percentage, the more accurate a multimeter is going to be. The percentage indicates how far off the reading might be, which is a big deal. A lot of the best – and most expensive – multimeters have less than 1% or 0.1% error. Measuring circuits and electrical currents is inherently dangerous if you don’t take proper precautions. 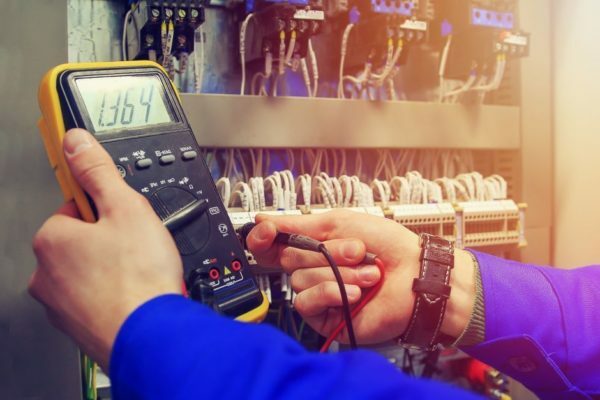 Using a multimeter is generally safe – especially if you measure electronics with low voltages – but it always helps to know some safety precautions before getting started. First, it’s essential that you check your multimeter before using it each time – especially if you use it infrequently. Take a look at the device and see if you can spot any damage to it. If so, you might need to buy a new one or test it before you measure anything. It’s a good idea to use a voltage-proving source before you get started measuring a component. These will ensure the reading is correct and that the multimeter is safe to use. When you’re getting ready to measure your component, you should always treat it as though the circuits are energized until you know otherwise. Be aware of your positioning and environment when you’re measuring, especially if you’re dealing with components that have a high electric current. Anything above 50V will require protective gear and a wealth of electrical experience. Ahead, we’ll take a look at some of the best multimeter options on the market. Of course, the one you select will depend on your experience level and intended uses of the product. With that in mind, this review has something for everyone. 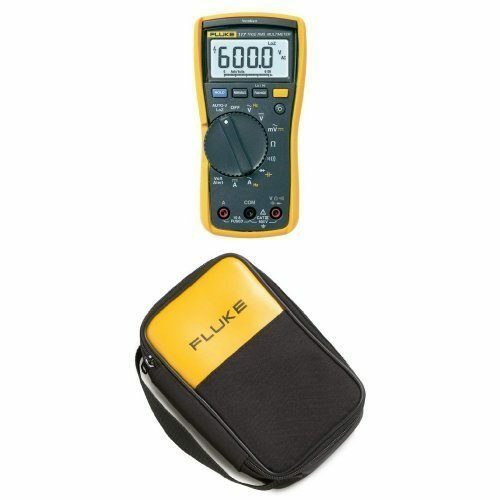 Fluke is one of the leading names in electrical testing, and many consider them to be one of the best multimeter manufacturers in the market. As the name states, the Fluke 117 is a true RMS meter, ensuring you’re always getting the most accurate readings through your tests. The VoltAlert detector is one of the standout features of the Fluke 117. The sensor on the top of the tester will be able to signify the voltage through a wall or cable. You can’t see the value through the display, but it allows you to test nearly everything without buying another device. The multimeter is small and light as well, meaning it won’t be a chore to lug it around. The size doesn’t mean it isn’t durable, though. The Fluke 117 can handle a few drops. The display is big and bright, which makes it easy to read, but it does fall short after repeated use. You may find that the resolution dulls a bit over time, but it’s still easy to read and shouldn’t be much of a problem. The Amprobe AM-530 TRMS Electrical Contractor Multimeter is one of our mid-tier picks for multimeters. It isn’t the cheapest multimeter you’ll find, but it will serve most of the measuring needs you have – provided that you’re not looking for something in the $200 + range. Apart from the basics, this multimeter has a VoltSense feature which allows you to check voltage without having access to the wires. Since the Amprobe AM-530 is in the mid-tier range, it’s essential that it’s easy to use for those without a ton of electrical work under their belt. This is one of the more intuitive multimeters we’ve used, with functions that are easy to understand with basic electrician knowledge. The device also has a flashlight feature, which is a nice touch. You can only use it when the multimeter is on, which means you won’t be accidentally draining the battery without knowing it. The build and display of the AM-530 are above average as well. Everything fits nicely on the face of the multimeter without making it too busy. There is a sturdy kickstand and a variety of features that may even go beyond what you need the multimeter for. The accuracy for this meter sits at around 1%, which is good but not great. Still, for home electricians, this level of precision will likely be enough. The INNOVA 3340 is another mid-tier multimeter that won’t break the bank. Like the AM-530 we reviewed above, this multimeter has nearly all the features you’ll need to do home electrical work – and then some. It even may serve the needs of a professional electrician on a budget. 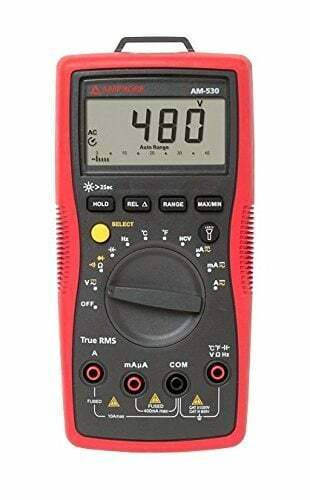 This multimeter isn’t the most accurate you’ll find – around 1%-2% for most applications – but it falls right in line with most of the other multimeters in the price range. Testing milliamps lose a bit of accuracy, but frequency, resistance, and AC/DC volts are all precise. The display on the INNOVA 3340 is in the middle of the pack. It’s clear and easy to read, but there’s no backlight which can be challenging in some situations. Still, it gives you all of the information you need including battery warnings, volts, currents, degrees, temperature units, ohms, and more. Those who are looking for a mid-tier multimeter for home use will likely be pleased with what the INNOVA 3340 offers. The Extech MN36 Digital Mini MultiMeter is our budget pick for multimeters. It isn’t the best one out there and doesn’t have the most features, but it’s surely one of – if not the – best multimeters in its class. Although the multimeter is small, it’s surprisingly durable. You don’t have to handle this one with excessive care as you do with some of the others in the price range. The stand is sturdy as well, which is a nice feature when looking at one of the smaller, cheaper multimeters. One of the reasons we included the Extech MN36 as our budget pick on this list was because of its accuracy. It might not have all of the features that some of the others do, but its readings are as accurate as many of the multimeters in the mid-tier range. There are some drawbacks to the Extech MN36, but most of them relate to the price range it falls into. It can be a bit small for some people to use comfortably, and the display tends to dim after repeated use. Still, even after considering these few drawbacks, we really liked what we saw from the Extech MN36. Those who are looking for a cheap, easy to use multimeter will be happy with the MN36. Those who have more advanced needs may want to look at one of the other multimeters we’ve listed. Reports of display dimming over time. There are a ton of features that come with the Fluke 87-V, including some quality of life improvements like the dual backlight settings. The Fluke 87-V is heavy and durable. It can be a chore to carry it around from jobsite to jobsite, but the accuracy and responsiveness are difficult to match – even when you consider some of the highest-priced multimeters on the market. Of course, not everyone is going to be able to afford one of the top-of-the-line multimeters like this one. We recommend this multimeter to professionals or those who take home electrician work seriously. Novice home electricians should look at the budget or mid-tier options. 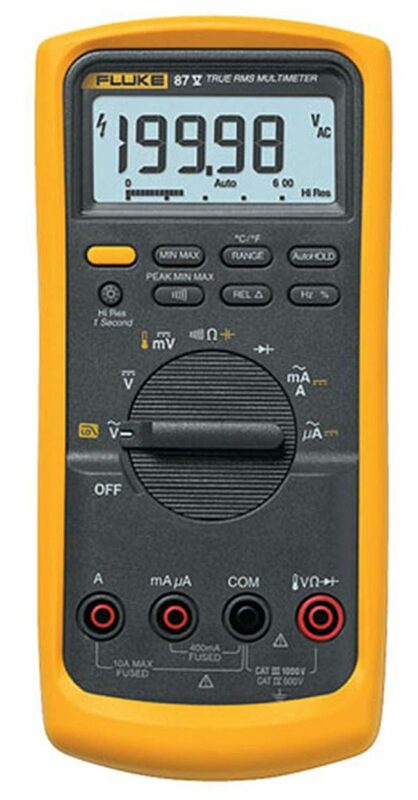 Out of the multimeters we looked at, the Fluke 87-V Digital Multimeter stands out as the best all-around multimeter. It has all the features you need, it’s durable, and it’s easily portable. Buying one from certain retailers will even give you a sturdy carrying case. Of course, this isn’t the multimeter that some of you will be looking for. Fluke products are expensive, and it might be overkill for what you’re trying to measure at home. If the Fluke 117 is a bit too expensive for you – or if you just don’t think you’ll utilize it to its full potential – then we suggest the Amprobe AM-530. This is an affordable, durable, and accurate machine that provides multiple measuring functions that other multimeters in the price range don’t match.